I really enjoyed this book and it was quickly read. The story of the three women held my interest all the way through. One aspect of this book that really grabbed me was that we can't always know what is really going on for a person or in a person. Take Samantha for instance, she was seen as the rich women who had it all and too snooty to be interested in the 'lower' class of people. In actual fact Samantha is a warm hearted caring person, her only problem is that she has denied herself to take care of her brother and sister and takes responsibility for their welfare. She has pushed back her own feelings and needs, always watching to see what is the 'right thing to say and do'. Her gradual awakening was a very important part of this book. Claire is an author who has left her neighbourhood and moved into the city. She spends her time staring at the blank page, unable to write the historical novel her publisher is expecting from her. She is learning to cope with living alone as her daughter steps out into college life and more independence. Her growing friendship with Samantha and Brooke is very important and eventually leads her to being able to form the printed word into a book - but not quite in the way she expected. Brooke is a mother with a two young daughters, she has worked to put her husband through his study to become a plastic surgeon. Now he has left her, for a woman who is willing to undergo the knife to look good. I love the way that Brooke grows as the story unfolds, and the way she begins to stand up for herself. These three women form a bond, they learn together what true friendship means, and how valuable such a friendship bond is. Edward the concierge is a character to admire, it is he who helps these women truly find each other as they watch the first and second series of Downton Abbey. 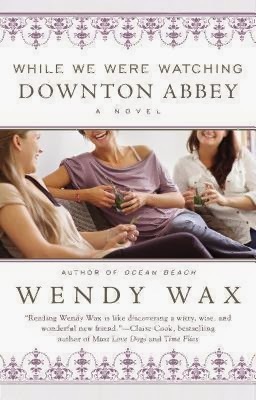 Like many, I too enjoy watching Downton Abbey, and it was fun to remember this series through the eyes of the characters. Sounds really good! I'm definitely adding this to my to-read list! !